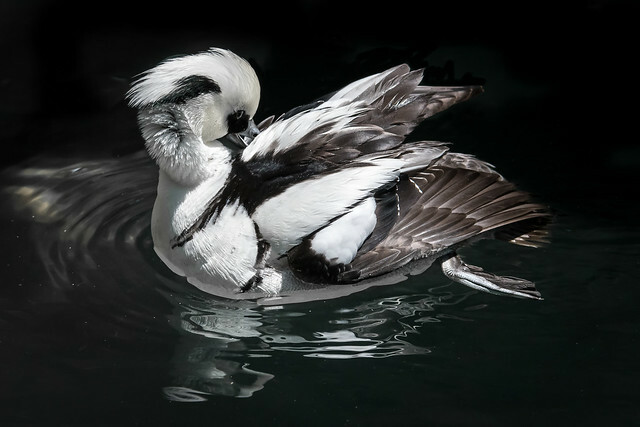 Description:Adult male smews in breeding plumage are white with a black mantle and two narrow black stripes on the side of the breast. Their flight feathers are black and their rumps and tails are dark grey. They have white heads with a black patch around the eye and some black feathers on the nape with a white crest above. They have short grey bills, reddish eyes and grey legs and feet. Adult female smews have grey upperparts and tail, mottled grey breasts and flanks, and white throat and lower cheeks. Her nape and hindneck are chestnut coloured. Adult males outside of breeding season are similar to the females. Juveniles smews are similar to females but they have dark brown lores and their eyes are grey-brown. Nesting: Smews nest in the hollows of trees at least 10 m above the ground. They line the hole with feathers and down. Smews lay 6-9 cream or pale brown eggs which are incubated by the female alone for 26-28 days. The male leaves the nest for moulting. Chicks are precocial when they hatch and reach sexual maturity at 2 years. Feeding:Smews eat small fish, aquatic insects and larvae. Where to see them: Smews are found scattered throughout the UK except the very north of Scotland. Look out for them on inland lakes in winter, particularly in very cold weather. Did you know? As male and female smews are rarely seen together they used to get mistaken for different species and have had a number of names over the years including ‘white nun’ (drake) and ‘weasel coot’ and	‘redhead’ (duck).